I put together this short video of Zach Johnson holing out a wedge to show “Why We Square-to-Square”. A lot of the the students who have worked with me on the Square-to-Square swing have found themselves hitting pins, holing out from the fairway, and even making hole-in-ones. 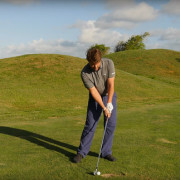 The reason is pretty simple… especially with the shorter clubs, if you employ a strong grip, limit the “flipping” of the clubface, and use your body to turn through the ball, you’ll find that you can consistently put the divot in front of the ball, and hit the line you’re aiming for. From there, all that’s left is to practice your distance control by burning-in your wedge positions (link to drill videos to learn this coming soon), and you’ve got the recipe to start getting deadly accurate in the “Scoring Zone” ( <= 120 yards from the pin). Hope you enjoy the video, and let me know in the comments if you’ve had a favorite “Pin Seeker Moment” using the Square-to-Square! Nice! 0-putts = lower scores! Yup! I’ve already dropped from a 36 to a 23 in about 6 months, and I don’t plan on stopping anytime soon. Hello Sam, I first saw your stuff about 3 years ago and liked the ideas, but i couldn’t do it. Revisiting now and took it to the range yesterday and still couldn’t do it! I am no mug, but i am a golf swing tragic, age 63, 4 handicap Australia, needing now a simple golf swing thats easy for an older body. i have always wanted to be Ben Hogan or Sam Snead etc but have given up on that. Had no success, as i said, yesterday, then back at home with a club in my room i was thinking about how you say to “rock” your shoulders, so i have to think about what is the difference between “rocking” and “turning” the shoulders. i have always been a “turner” of the shoulders, turning the right shoulder around behind me, either steep or flat, when this doesn’t work i try a steep down the line turn etc. etc. all of which does not work at all well. So, at least in my room, i think i see the difference, “rocking” is like holding a baby in your arms and rocking back and forth so the baby doeasn’t fall out, there is still “turn” but no “twist”, the arms slide up and down the chest more and the return “rock” back through the ball is very natural, no getting “stuck” etc. The obvious goal as i see it is to simply have the club travel with you as you go back and forth, without having to do arms/body manipulations. My club almost always buys a ticket to a different destination. So, i am wondering if this thinking is on the right track. And thanks very much for all your hard work. if I could make one suggestion, without criticizing, i think you have overlooked doing a clear explanation of the “rocking” shoulders in your vids. perhaps to you it is so simple its obvious but maybe not to others like myself. Everything else in all your vids is completely clear to me, the concept is great, your swing is great, but why can’t I do it? The answer is I think the most basic primary motion of the shoulders which is very easy to get wrong. thanks again, i shall persist, I have a bet to collect if I get to scratch by Christmas!! Sam, I am in the same boat as Mark P. regarding the difference (if there is one) between “rocking” the shoulders and “turning” the shoulders. Words mean different things to different people…can you take a moment and add some clarity to “rocking” vs. “turning”? Thanks for the comment cliff. I feel that most golfers use their arms to take the club away which leads to a very limited shoulder turn which leads to lack of power. The rocking, tilting, turning of the shoulders as a first move in the take-away is a huge help in eliminating this issue. I will say too that the lead shoulder definitely goes down and toward the ball in the take-away. So sometimes the word “rocking” helps to lead this motion. The degree the shoulder goes down and toward the ball changes with the length of he club naturally which will cause a more vertical shoulder rock with the wedges and a slightly more horizontal move with the woods. Hope this helps to clear things up a bit. Sam, I have read your ebook and have been practicing the square to square method during the past three months. I really like the simplicity of the method, but have one problem. With the club face closed at the top, my trajectory is much lower now. I’m hitting the ball well and my distances are great. However, I really need to get the trajectory up. Any suggestions would be greatly appreciated. One thing, you might get some insights from the “tour radius” video. It shows how to maintain forward shaft lean and hit high shots. Also, the long range pin sniper course is very good to help with shallower divots and higher launches.